When fishing gear gets in the recycling bin, especially fishing line, it causes SERIOUS damage to recycling equipment. 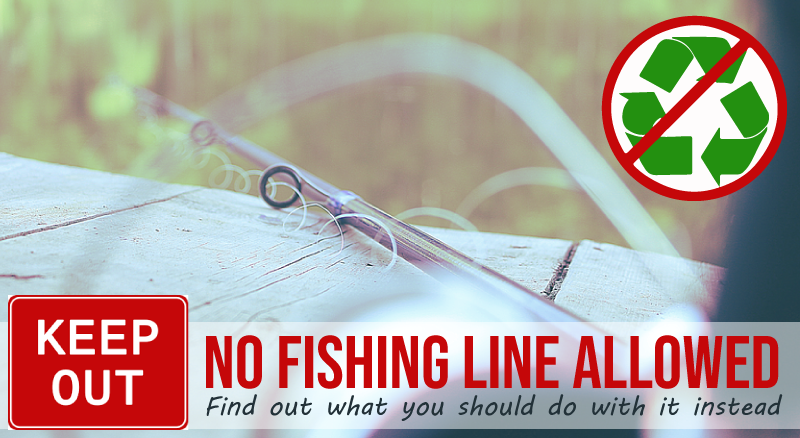 However, if left lying on the ground or floating in the water, monofilament (“mono”) or nylon fishing line is extremely hazardous to the wildlife that might get tangled in it or ingest it…so what should you do with it in the Sioux Falls area? Mail In: You can mail used mono line and spools to Berkley Recycling in Spirit Lake, Iowa for specialized recycling. Just place in an envelope or box and mail to 1900 18th Street, Spirit Lake, IA 51360-1099. Make sure to write “recycle” on the outside. Collection Bins: In some areas, on-site collection bins for old fishing line may be available. There are currently no confirmed bins in Sioux Falls, but there have been local collection programs in the past. Keep an eye out for signage that may direct you to bin locations if they’re available. Trash: If mailing isn’t an option and there are no bins available, you can place the used line in the trash. Just make sure to cut it up into smaller pieces and keep it contained in a covered container or plastic bag if possible to prevent harm to birds or other wildlife after it gets to the landfill. Any questions? Let us know! Thanks for recycling right in Sioux Falls! There are 0 comment. on "Keep Fishing Line Out"